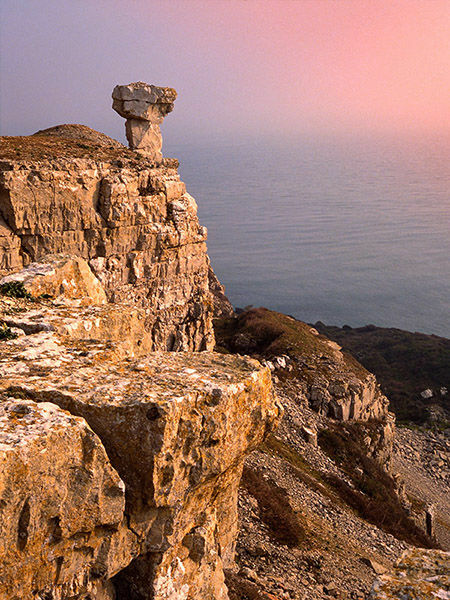 Dorset’s Jurassic Coast is something of a time warp; here you can travel through history and time. In this landscape rocks and fossils detail each element of the Earth’s past; with the cliffs and shoreline providing a living texture through the layers of sedimentary rock exposing 185 million years of history. The Jurassic Coast is one of the most photographed locations in Dorset and I am very fortunate to live within easy reach of this World Heritage Site. The skies, the light and the elements combine to make this a fascinating location for both artists and photographers. In particular I find the rocks around Kimmeridge Bay provide shapes, colours and textures as a result of years of sea activity and erosion. In late afternoon light their colours and textures are enhanced by a low sun which provides a palette of colour.